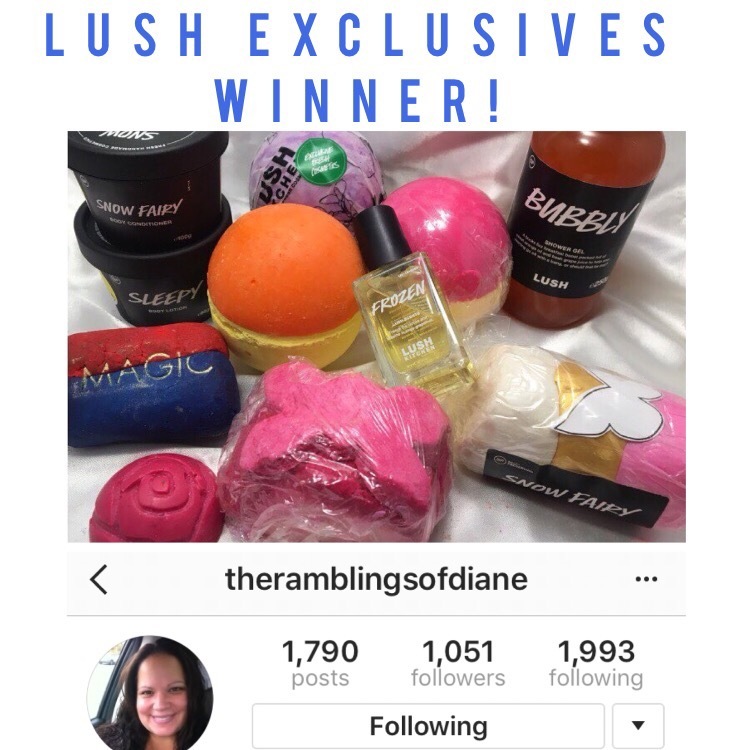 Congratulations to @theramblingsofdiane (Diane P) you are the Winner of my Lush Kitchen exclusives Blog Giveaway! 💗Lush Exclusive ‘Magic Bubbles’ bar. bubble bar in the yummy mummy scent. 💗Lush Kitchen ‘Road From Damascus’ bath oil. 💗Lush ‘Bubbly’ shower gel. 💗Lush Snow Fairy FUN bar. 💗 Lush ‘Sleepy’ Twilight scented lotion. Posted on December 19, 2016 by Lushalot	• This entry was posted in Uncategorized. Bookmark the permalink. How do you enter and how often do you do giveaways? Hi Laura I do Giveaways about once a month.